John A. Panning, like many organbuilders, has had a lifelong fascination with the organ. Born in Watertown, Wisconsin in 1963, the son of a Lutheran minister and educator, he was exposed at an early age to the pipe organ and its music. He fondly recalls his mother’s inherited Estey Cottage Organ, which John learned to play around age seven, although he did not start piano lessons until sixth grade. He began studying organ in high school and has regularly played for church services ever since, providing him experiences with organs of all kinds. 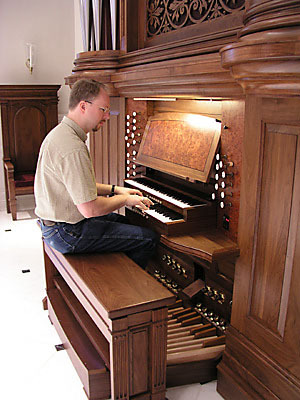 Although there was some hope that he would follow in his father’s footsteps, John was intent on building pipe organs. After graduating from high school he worked for Milwaukee area organbuilders Hammes-Foxe, acquiring his first taste of the organbuilding business. After two years with this small builder of mechanical action organs, he joined the Dobson firm and moved to Lake City in January of 1984. The shop was small at the time of John’s arrival and so he was engaged in all areas of organbuilding as well as service and tuning. From the outset he was interested and involved in the tonal aspects of organs and worked closely with the late Robert Sperling in voicing and tonal finishing. In 1992 he set up the company pipeshop and himself made the first pipes in Lake City. Beginning with Opus 59, in 1993, John was asked to assist with tonal design of new instruments and determine the pipe scales. This eventually led to his appointment as Tonal Director, although he remains involved in many other aspects of the firm’s activities, including that of website manager. Anyone who knows John would tell you that he is extremely well read, with interests in and broad knowledge of subjects ranging from American bridge building to theology. He is the shop’s resident wordsmith, called on to write or edit much of the printed material that leaves the office. John is fond of Lutheran hymnody, which he is known to recite or sing with great abandon from within the organ case as he works on a pipe. As one observes his keen ear for the subtleties of voicing and tuning, one soon learns he has perfect pitch. And, whether it is technical information, rules of grammar, organ stoplists, the year an instrument was installed, or an obscure hymntext, John has a quick and sharp mind which seems to recall nearly everything! 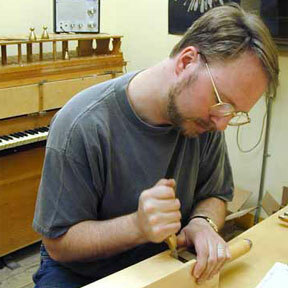 In order to gain the valuable experience and historical perspective that underscore the links Dobson instruments have to their heritage both here and abroad, John has studied many historic organs in Europe as well as important instruments by American builders. He has served two terms as National Secretary of the Organ Historical Society, two terms as Secretary of the American Institute of Organbuilders, and since 1991, has served as North American Editor for the Journal of the International Society of Organbuilders. John lives with his wife Judy and two elusive cats in a large, historic home in Lake City. Judy is the music teacher in the local elementary school, teaches piano privately and directs her own Young Musicians Workshop, a developmentally appropriate children’s music education program she has introduced to the Lake City community. At the console of Op. 80.